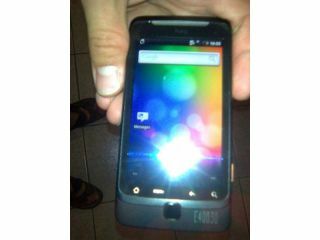 Spy pictures of the HTC Vision have been released, showing off a high-end specc'd smartphone with a full QWERTY keyboard. While some were hoping the HTC Vision would be a Desire with a keyboard, design-wise, the Vision looks a touch uglier, with the 'Terminator eye' optical trackpad missing. At least the screen-size is the same 3.7-inches as the Desire. It also has a 1GHz processor and seems to be sporting Android 2.1 – which will more likely be 2.2 when it is officially released. It will be interesting to see what the market is like for another Android smartphone with a real keyboard. Most Android releases of late have dodged actual keys in favour of a full touchscreen experience. The HTC Vision seems to have HTC's Sense UI overlay, which means that even if its chassis isn't the nicest we've seen, the OS will be.